UNITED NATIONS, December 21 -- Left to the last day before Christmas holidays are the UN's scale of assessments for its budget, its revolving door policy, and the resolution on Iran. 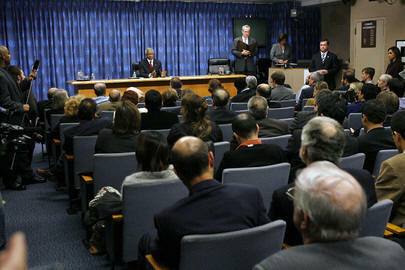 "I don't have much for you today," Kofi Annan's spokesman said to kick off his Thursday noon briefing. The dictator of Turkmenistan had died during the night, and Inner City Press asked: "Does the Secretary-General have any comment about the passing of the leader of Turkmenistan?" Spokesman: Yes, as a matter of fact, as you were asking me questions, I was given a statement. It says the Secretary-General has learned of the sudden death of Turkmen President Atayevich Niyazov. President Niyazov made important contributions to United Nations peace processes in Tajikistan and Afghanistan. The Secretary-General extends his condolences to the family of the late President and to the people of Turkmenistan. It is said that whenever a head of state dies, no matter how repressive, the UN is required to lower the country's flag, and to issue a statement, even if curt and perfunctory. A more artful statement might have said, "the UN feels as the people of Turkmenistan do." But this is, after all, the UN, a club of sovereigns, whatever their human rights records. UNDP praised Turkmanbashi right until the end - click here for analysis for earlier this Fall. And remember -- the just-left Under-Secretary General for Management now works at the (Deutsche) Bank where Turkmenbashi stashed three billion dollars. We're still waiting for a comment, from spokesmen here or there. The Deputy Secretary General, it is reported, was buzzing through the UN's basement, going to the General Assembly meeting where the budget was discussed, saying, we can tell them anything we want. Multiple sources place the Deputy Secretary General over the draft revolving door policy, which would have prohibited ex-officials from lobbying the UN for two years. The DSG wants that out; some say the plan is to set up a sort of private UNDP, to be funded with UN money. Time will tell. The president of the General Assembly gave a news conference, at which most questions concerned the budget-down-to-the-wire, and what each country will pay. What is the difference, you ask, between 4.5 years and the average between six and three? The European Union, which has been growing fasted, would like to include the six past years to calculate its income. Japan, more recently slowing, would like to count only the last three. Compromise and leave town, the staffers whisper. The GA president answered Inner City Press' question about the failure to enact the declaration on the rights of indigenous people by saying she has met with "three or four NGOs." Video here, from Minute 19:35. The UN's own write-up of the press conference does not even include the issue - click here to view. Perhaps it is the holiday season: only happy news. Inner City Press: Yesterday, the [European Union] EU confirmed that it will oversee policing of the judiciary in Kosovo after the Ahtisaari announcement, and the quote was, "the international community does not want to remain doing this. Has Ahtisaari said anything to predict this?" Is that the way it�s going? Spokesman: I can't and I would not want to prejudge the conclusions of Mr. Ahtisaari�s report. There are obviously a lot of comments being made left, right and center but we have to wait for Mr. Ahtisaari's report. Inner City Press: In Nepal, there were earlier reports that everything was going smoothly and now the Maoists have called for a general strike. Has Ian Martin or anybody said anything? Is that a threat to the process? Inner City Press: I think earlier it was said that [Office of Internal Oversight Services] OIOS would give us a briefing, maybe before the end of this year. Is that going to take place? Spokesman: OIOS told me they would be willing to give a briefing as soon as the resolution regarding OIOS has been passed in the General Assembly. Gail isn�t here. I will check with her. When that happens, we'll go back to OIOS. Inner City Press: If it's passed Friday, they wouldn�t hold the briefing then. Spokesman: I would think early in the year. The idea is not to bury the briefing. Inner City Press: No, and also, not to say this is being buried, but the anti-revolving door policy? Will it be announced tomorrow, before noon or after noon? Spokesman: We are determined to get it done before the end of the year. It is being finalized. I would be very happy to announce it for you tomorrow. 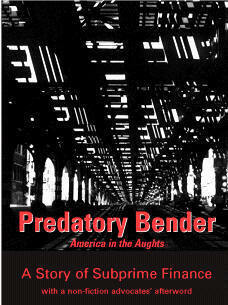 Inner City Press: And Ibrahima Fall, first we learned that there are two of them yesterday. Spokesman: Each person is their own person. They just happen to share the same last name. Question: And first name. That's what's confusing. But the Great Lakes Ibrahima Fall, is he continuing on with his Great Lakes mandate? Spokesman: I think the mandate is continuing. Who is the other Ibrahima Fall? Q The UNICEF Ibrahima Fall, who went to [ Central African Republic] CAR? Spokesman: That's two different people. The tale of the two Falls, twin Falls, Fall guys, will continue. UNITED NATIONS, December 20 -- Two faces of development aid were on display Wednesday at the UN, and both on the same person. Jeffrey Sachs took questions from journalists, urging them to "keep your eye on" aid "commitments and gaps" to ensure funding for such initiative and medicated bed-nets against malaria, and a Green Revolution in Africa project of the Rockefeller and Gates Foundations. Smaller-scale, he acknowledged having previously been paid $75,000 a year by the UN Development Program, but stated that he has quite recently decided not to accept such funds in 2007 "so that there will be no confusion." Some who welcomed the announcement expressed hope that UNDP might someday become equally as adverse to confusion. 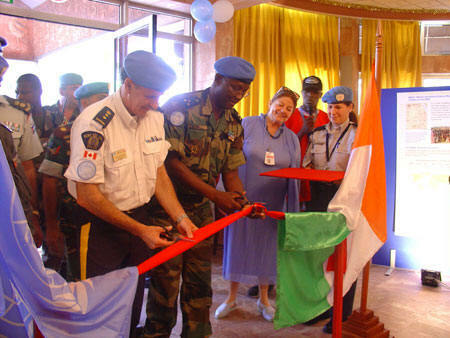 During the now three weeks of Inner City Press' daily series on the UN Development Program, sources in UNDP have described a process in which the entire staff of the UN Millennium Project, which Mr. Sachs has led since 2002, was merged into UNDP, in seeming violation of applicable recruiting and hiring rules. UNDP has stated in writing that it will not respond to questions about these employment practices, nor will it release audits, neither to the media nor to countries which fund UNDP. Regarding Mr. Sachs, several UNDP sources suggested that inquiry be made into compensation beyond the previously announced One Dollar a Year service to the Secretary General. Dear Matthew...we have decided to merge the work of the Millennium Project into UNDP. To this end, UNDP has set up a new sub-unit in our poverty group, which will consist of some 20 positions. To complete the integration by the end of the year, UNDP management is using an expedited competitive recruiting process for five lead positions. These five positions have been advertised and are in the process of being filled. Five other positions do not require a competitive process under UNDP recruitment procedures and will be filled with people currently working for the Millennium Project. All other positions will be recruited according to standard UNDP recruitment procedures, and this process is on-going. Outside spokeswoman Erin Trowbridge had previously confirmed in response to Inner City Press' questions that Mr. Sachs was being paid $75,000; UNDP stated that this would continue in 2007. Wednesday Inner City Press asked Mr. Sachs for his view on whether UNDP should, like the UN Secretary, make full copies of its audits available to any member state which asks, rather than only providing summaries of audits, and then only to the 36 nations on UNDP's Executive Committee, as is currently the case at UNDP. Inner City Press had on Monday asked the same question to the prime minister of Spain, who said, yes, that should happen, "of course." "I don't have any considered view or any expertise on this," Mr. Sachs responded on Wednesday, declining to comment further on audits. Inner City Press then asked Mr. Sachs to comment on the complaints of UNDP staff that the Millennium Project personnel are being brought into UNDP in violation of staff rules -- "making a mockery," one impacted UNDP staffer called it. "I am not aware of any of that process," Mr. Sachs said. "I don't do that stuff." "But isn't it the case that you are paid $75,000 a year by UNDP?" Inner City Press asked. "That was during the Millennium Project. Is it not the case going forward," Mr. Sachs said. Video here, from Minute 12:20. Inner City Press wanted to ask about UNDP's statement, two weeks ago, that these payments would be made in 2007 as well, but the moderator turned to another reporter, promising to allow further questions from Inner City Press later. Mr. Sachs went on to speak of bed-nets and projects in Malawi, to praise Hillary Benn of the UK and a fertilizer conference in Nigeria. A reporter from a salmon-colored daily opined that UNDP's Administrator Kemal Dervis has been missing in action for 14 months, and that UNDP's communications office is barely function, other than to strike back at reporters in attempts at brand control; he referred to the sound of tumbleweed blowing down First Avenue. Mr. Sachs responded that Mr. Dervis has been busy with the high level panel on coherence, after which the level of emailing has "scaled up." Once allowed another question, Inner City Press asked about UNDP's email of December 6. "Was that not true at the time?" "That's not true," Mr. Sachs said. "I will take in one dollar in salary, honorary." Inner City Press asked Mr. Sachs to explain accepting the payments in previous years, after acknowledging that it's not a huge amount of money. After the press conference was over and the cameras were turned off, Mr. Sachs repeated to Inner City Press, "I did not do this job for the money, I've had much more lucrative offers." 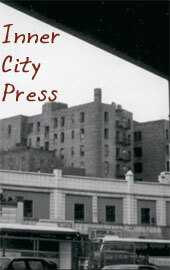 Inner City Press asked when the decision was made to not accept the money in 2007. If in Chad the percentage of people with access to improved water systems rose from 19% to 42%, while that is in a sense cutting the problem in half, is 42% acceptable? Mr. Sachs pointed out at the Goal is to cut in half those without access to clean water. Can a metric be designed to not provide "false positives" of acceptable levels of being confined to unclear water? We'll see. Mr. Sachs said, "I know you mean well, but be careful." News analysis: While a right-tilting but sunny journalist afterwards quipped that he'd say the same to Mr. Sachs, Inner City Press wants to distinguish between legitimate journalistic inquiry into UNDP, and the wider UN's system of Dollar-A-Year promoters, and any attack on the goals Mr. Sachs promotes: the eradication of extreme poverty by 2025. There are lacks of transparency, and the wasting of bottled-up talents from below due to favoritism and a star-system at the top -- but eradication of extreme poverty is the goal, to be advanced in 2007 and beyond. Mr. Sachs' defenses of Africa against stereotypes are also heartfelt and much needed, and should and surely will continue. A wider development scandal, as pointed out by Mr. Pink, is the World Food Program's function of dumping surplus U.S. commodities and thereby undermining Africa's own agricultural markets, and then swooping in as the hero to solve a problem WFP itself has helped create. With Josette Shearan Shiner slated to take the WFP reigns at year's end, that too will be a focus. UNITED NATIONS, December 20 -- As the UN Operation in Burundi is slated to end on December 31, at UN Headquarters on Wednesday a briefing was held, complete with "End of Mission Press Kit." This contained photos of Burundi and much happy talk about the country's future. But was Inner City Press asked in the briefing, the ceasefire agreement has yet to be implemented, and the previous president is currently on trial for an alleged coup attempt. In line with a recent cautionary speech by the UN's own William Lacy Swing, envoy to the Congo, is now the time for the UN to pull out? "It is an issue concern, there is no doubt," said Nureldin Satti, Acting Special Representative of the Secretary-General for Burundi. "The ceasefire has not been implemented," the problem turns on one of "provision immunity." Through the Arusha process, rebels and those in the "political class" are to receiving interim immunity until a truth and reconciliation commission and high chamber are established. The result, according to another UN staffer, is that there are young men with guns in camps around Bujumbura, and not enough jobs to be had. Inner City Press also asked about the coup trial of Domitien Ndayizeye. "I'd like to trust the government to respect and abide by due process," said Nureldin Satti. Good luck. After a later Security Council briefing by Ibrahima Fall, about the Greak Lakes peace process, Inner City Press asked Mr. Fall about conditions in Burundi. Mr. Fall repeated, as if by rote, that the UN has done a great job in the countries of the Great Lakes, an assertion that many, including in the UN system, would challenge. Inner City Press asked about immunity not only in Burundi but also for Joseph Kony, the head of Uganda's Lord's Resistance Army. Mr. Fall's response predicted a balancing of justice and peace. But when asked what this balancing might consist of, Fall only said it would be found in Juba. They're still looking. It turns out, as one generally sharp correspondent in French found out, that there are two Ibrahima Falls in the UN system, and it's the other Fall, the Fall guy, who recently visited the Central African Republic. Similarly there are two Lamine Cisse's, although at least each spelling somewhat different. The Great Lakes Commission is establishing its Secretariat in Bujumbura, clearly an expression of hope and confidence. We wish them well. This column covers Mr. Annan's final press conference, his farewell to staff in the UN cafeteria, including staff members' tributes, and a final, similar speech he delivered to journalists later in the evening in the Delegates' dining room. Inevitably it touches on the still-heating-up search for jobs, the musical chairs and agita upstairs. Throughout the day Mr. Annan returned again and again to the Oil for Food scandal, and to a call that it was a "one-off," and that UN staff should not be painted with a broad brush. This last was said in response to Inner City Press' question at Mr. Annan's final press conference. Transcript below, and video here, from Minute 41:45. Not raised at Mr. Annan's press conference was not only a car still-unresolved, not only Mr. Annan's ultimate non-action on human rights in Zimbabwe, but even the outright war heating up in Somalia. Many said the presser was too bland and made no news. Perhaps because he was leaving, questions such as "tell us your top three achievements" were asked. Click here for the full one-hour video -- one detail it misses was a fly that buzzed around the rostrum at the press conference began, incongruous and alive and then suddenly gone. At Annan's farewell to staff, there was a crowd standing out in the lobby. Some said the event should have been held in the GA hall or some larger venue. Inside the cafeteria, Mr. and Mrs. Annan were on a raised area where usually lunch is eaten. Tributes were given by staff members. Robin Delarocca spoke movingly of her service, and of to whom Mr. Annan says hello in the UN hallways. Gordon Tapper told a story about Mr. Annan given allergy medicine to his wife. Three of Mr. Annan's security team -- two left without last names, John and Louie, by the third, a comedian, who will also go unnamed -- handed him a mock-up grounds pass, two feet tall with the word "RETIREE" down the left side. "It's a good picture," the master of ceremonies said. "I should have used you more, as an M.C. at these things," said Ahmad Fawzi, previously a spokesman, now head of the media division of the Department of Public Information. To venture into the musical chairs of positions, because the topic is so much discussed within UN headquarters these days without being covered elsewhere, the current spokesman is said to be seeking a Fawzi-like position. Another opines that after a sufficient time away, Ban Ki-moon might bring him back. "They sure could do worse." The scuttlebutt on Peacekeeping is that the mysterious vote against Mr. Ban during a summer straw poll was from France, to signal it wanted to keep the DPKO slot. Whether it will remain Mr. Guehenno, who ambled into the staff cafeteria to hear Annan's goodbye, remains to be seen. DPKO deputy Hedi Annabi gave a speech, how Mr. Annan called his home on a Saturday evening and asked to speak to his wife. Mr. Annabi said this was Annan's way of apologizing for having to call on a Saturday evening. The scuttlebutt on the U.S. peacekeeping ambitions has them gunning for the Number Two spot. But who would take the Saturday evening call with the aplomb of Annabi? More reachable by email is Jan Pronk, former SRSG for Sudan, who was in Headquarters on Tuesday. Inner City Press caught up with him on the escalator, in the S-G's view; blogging was discussed and best wishes were offered. It is a charitable season: earlier on Tuesday, when Inner City Press asked the Vice President of Iraq for his review of SRSG Qazi, it was effusive. Video here. During the cafeteria ceremony, the representative of New York UNICEF's staff association noted that Mr. Annan at his press conference earlier in the day had "reminded a reporter of the hard work" of the staff. See transcript below. There are many talented staffers who could do more to help the world than their supervisors, sometimes cronies and yes, sometimes abusive, allow. Beyond Oil for Food, which Annan mentioned twice in his cafeteria farewell, what for example of the ex-head of UNHCR and the charges of sexual harassment? 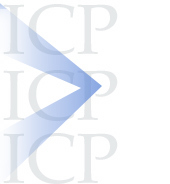 In Inner City Press' ongoing UNDP series, what of Kalman Mizsei, until recently the head of Europe and CIS States? Did the lack of coverage of such behavior help the UN or its staff in any way? This is why aggressive investigative and workplace reporting should be encouraged and not, as Mr. Annan put it, "painted with a broad brush." Inner City Press: Mr. Secretary-General, I�m going to use the word �transparency� rather than �corruption�. UN reform has been a theme in recent years. But some are saying that it has been focused mostly on the Secretariat, not on the funds, programs and agencies of the UN system. Recently an investigative series about UNDP: your Deputy Secretary-General had only harsh words for it. But the Spanish [Prime Minister] yesterday, sitting where you are, joined a call for transparency or providing audits of UNDP to all the Member States, rather than as is the case now, only summaries to some Member States. I am wondering what you see as the next steps, in terms of increased transparency in the whole UN system, not only the Secretariat, and what you see as the next steps in UN reform more generally. The Secretary-General: Well, obviously, I don�t know what my successor will have in mind. But the UN and its agencies have tried to be as transparent and responsible, for the resources entrusted to them, and they do provide records to their governing board and to the countries supporting them. Quite a few of these institutions have already gone through their own reform, from UNDP to UNICEF to UNHCR, and the other agencies -- ILO, UNESCO -- have gone through their own institutions and report to their own governing board. And I hope they will remain vigilant and continue to do so. I don�t have the details of the issue you are referring to, but UNDP is a very responsible and serious organization and highly respected. Obviously, I cannot say that there may not be one or two bad apples, as we have here and we have in any other institutions. But again, we have to be careful not to generalize and tar every staff member with the same brush. 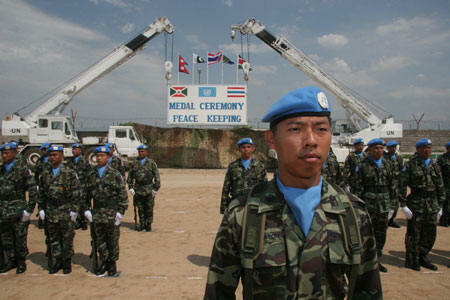 I have often said that the UN staff and people in these agencies deserve our appreciation and thanks. They often serve in places where Governments are afraid to send their troops, and they really do a lot for the world. So we should also look at some of the contributions they make, not always trying to look for something to hit them on the head with. If there�s something that is wrong, you should criticize, but you should also look at the positive work that they do. As to the statement that he is unaware of the "specific issues" about UNDP's policy of not providing copies of audits to any members states that ask (as even the Secretariat does), but only summaries of audits to those on its executive board, Inner City Press' UNDP series has laid these differences out, and UNDP Number Two Ad Melkert last week acknowledged the difference and that it should be fixed. Inner City Press: Mr. Secretary-General, this is also on small arms. Earlier in the week I asked your spokesperson about UNDP-funded disarmament in Uganda of pastoralist tribes that use the guns really to defend their herds. I guess what I want to ask is, although we are still pursuing it, there seem to be abuses in the program; we have asked how much funding UNDP provides for the disarmament of pastoralist tribes. I will say that for four days we have been unable to get even a number about how much is funded. So I guess, this idea of freedom of information act, which I once asked you about before? Is it your sense that a UNDP agency should be able to, in four days, disclose how much it is funding a program? SG: I am not sure I would tie that to a freedom of information act. I am not sure whom at UNDP you asked, but this kind of information is generally open; the UN peacekeeping budgets are open, and the amounts of money we spend on disarmament efforts are public information, for the public. So I really don't know whom you asked in UNDP, and why you haven't got it. And really, don't expect me to give you an answer. But I wish you pursue it. They should be able to give it to you. The above concerned UNDP's funding of a plan involving disarmament in Karamoja, where soon the Ugandan army was killing women and children in the name of disarmament, as decried by the UN's own Louise Arbour. 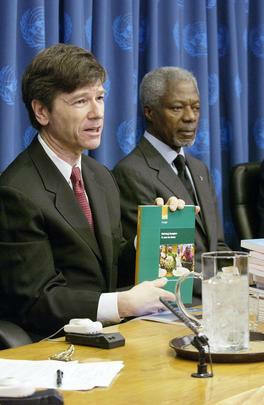 In June 2006, Mr. Annan stated he didn't know about these UNDP issues. On wider UNDP issues in December 2006, a similar answer. Is it time for more hands-on? Some say it is. But on the issue of treating UN staff fairly, there is much to be said. There are many talented staffers who could do more to help the world than their supervisors, sometimes cronies and yes, sometimes abusive, allow. So to not inquire into these problems is not a favor to staff -- quite the opposite. Mr. Annan's cafeteria talk ranged, as he put it, from P1 to the top, from WHO in Geneva in 1962, through applications for Brazzaville or Alexandria in Egypt, to ECA in Addis Ababa for six years through DPKO to the top. He praised his team on the thirty-eighth floor, including "Nadia and Sergio and Elizabeth Lindenmeyer and Riza." One wanted to hear thanks to, for example, Edward Mortimer, supervisor of words, who at the final goodbye of the evening confirmed not only that the same staffer wrote Kofi Annan's and Ban Ki-moon's jigsaw-like speeches for the Correspondents' Association dinner, but that the staff has done it two other times, on Monday night and at an IPA event. Annan on Tuesday thanked deputies past and present, and "the first woman chef de cabinet -- but hopefully not the last!" This seemed directed at Ban Ki-moon. For his deputy slot, there's talk of Colombia and foreign minister, of the head of UNFPA, and, perhaps more promising on human rights, of the head of UN-HABITAT, she of the detailed report on the Mugabe regime's mass evictions in Zimbabwe. Some concerns are being expressed about the speed, or lack thereof, in the naming of names. One Security Council source on Tuesday told Inner City Press that this holiday season, with so many on vacation, is a time to keep watch on the still-smoke-filled rooms. Keeping watch is what we do -- check this site. Again, as they used to say on TV game shows, keep those cards, letters and emails coming, and phone calls too, we apologize for any phone tag, but please continue trying, and keep the information flowing.